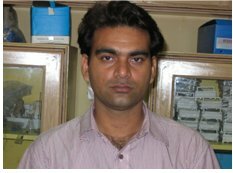 Mr. Supakar has a Bachelor in Pharmacy (B. Pharm) from Utkal University and obtained a Post Graduate Diploma in Bioinformatics from Jadavpur University. He worked on chemical characterization of a few very important medicinal plants of Orissa. Currently he is actively engaged in developing a bioinformatics software suite with a graphical interface, targeted for sequence analysis and structural biology applications. He is also working on molecular modeling of nuclear cap binding proteins such as CBP80, CBP20 and on the development of a medicinal plant database of West Bengal, with specific focus on 3D structures of active ingredients.